Showing results for tags 'control board'. Bosch wall oven, microwave combo, HBL5750UC/08 Problem: In any cook mode but off, broiler element comes on and stays on. This used to happen intermittently, now all the time. Eventually the over-temp sensor will trigger and turn it off. Turning oven to "off" will turn off broiler element. Built-in diagnostics (from downloaded service manual) don't show any relevant faults. Temp readings from sensors (again, using built-in diagnostics) seem accurate. Using diagnostics to turn on broil element turns it on, but again, will never turn off. All of this leads me to believe it is a stuck relay? Question: I've seen references to a "control/relay board" and a "relay board". I suspect one of these components. Control/Relay board comes up as Bosch part #12022212. This board looks like it has many small relays on it. Relay board comes up as Bosch part #00663802. This looks more like a power supply board than a relay board. Should I replace the relay board? 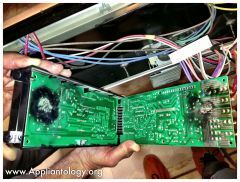 We've been selling our custom oven keypad replacement solution online for about nine months now and have run into this problem many times: The customer doesn't feel confident enough to install the part themselves. 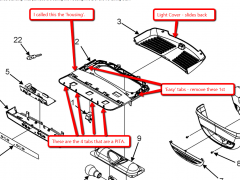 We have created pretty thorough installation manuals complete with detailed, high res photography to instruct them in what we already believe is a fairly simple operation. 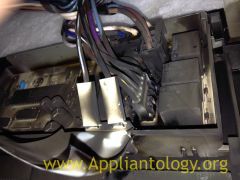 Nevertheless, appliance control parts appear to be intimidating to the average homeowner. Our product - The LinkBox: a small electronic module (typically half the size of an OEM control board) that installs on the backside of an oven touchpad next to the OEM control board. The module has a mounting bracket on it that mates with the mounting bracket for the OEM control board. 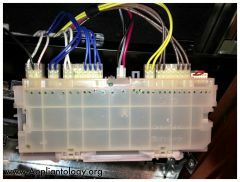 It comes with a ribbon cable and two leads for L1 and N. The ribbon cable connects to the OEM control board in place of the OEM panel's ribbon cable. 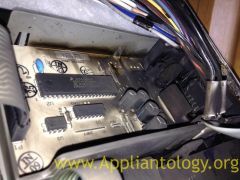 The L1 and N leads terminate in piggy-back terminals (or a special adapter depending on which model appliance the customer has) and are to be connected in parallel with incoming power to the OEM control board. It ships with a 7" tablet that will automatically boot into the user interface and establish a Bluetooth connection with the LinkBox when powered on. And that's it. When the customer wants to have this installed by a tech, we will refer them to you, and you can charge them a typical install fee or whatever you want! But it sounds like you get $50-$100 and a happy customer for about 10 minutes of work. At this moment, we are looking for techs in the following areas: Las Vegas, NV Maxton, NC Please let us know if you can help! 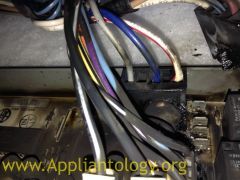 -BoardFruit, Inc.
Hello, I had an issue with my dishwasher where it would not turn on the heating element. Checked the element and thermostat and thought it might be control board so I called Sears to sent out a repairman. Turns out the control board just needed resetting. I don't want to pay to have someone come out and push a couple of buttons so I'm hoping someone can assist in telling me what key sequence needs to be done in order to reset the control board? It's a Whirlpool Gold Series WDF750SAYB3 with the buttons on the front of the unit if that helps. Thanks in advance! This Class Code 91 letter is for control board W10219463 replacement for Kitchen Aid, Jenn Air, Thermador, Dacor, & Kenmore Built In Refrigerator Units. This part is no longer available. Due to the failed ACU board W10219463 and the complexity of the control boards function the only resolution is to replace the entire control assembly with a service kit. 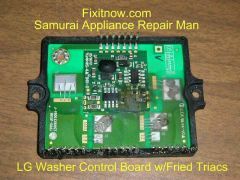 Any product requiring this board will need to order one of the service kits according to model number. GE WCVH6800J1WW Machine stalled during wash cycle. could not get control board into test mode (didn't respond to signal, delay start, signal, delay start). I was told I needed a new control board. Replaced exactly as instructed and empty machine ran through all testable modes (fill, agitate, drain, spin, high speed spin, etc.). With full load machine stalled again. More importantly: NEW BOARD WILL AGAIN NOT GO INTO TEST MODE! Is there something wrong with both boards (old/new) or is some other fault in the machine affecting the board. Can the new board be reset if I can't get it into test mode? Reset by some other mechanism/technique?? Kitchen Aid model no KSBS25FKBL02 compressor won't start. All fans on. All compressor windings good at 6.5 ohms. Input to inverter board from control board reads 3.33 VDC. Is this too low? What can I do to isolate between control or inverter boards? I have a Dometic Microwave model 56-2272-10/02, I believe this was made by Frigidaire. 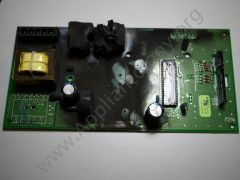 Manufactured by reads WCI I am in need of a control board, or help repairing the control board. have not found the part to be available. Any help would be appreciated. I'm wrestling with a defrost issue with Frigidaire side by side. Had it serviced by a tech due to a drop in temp and alarm beeping. Coils were completely encased in ice. After manually defrosting, heater and defrost thermostat were tested to be within spec. Conclusion of the tech was " bad main control board". Quoted price was 300.00 plus labor. I sourced the part locally (new) and replaced it myself. Fridge came to temp quickly and held with no issues for about a week then the same symtoms appeared - back wall and coils completely iced over, obviously not defrosting. What do I look at next?